We spent the weekend in Clearwater Beach, hosting a group of teachers and administrators at our inaugural Leadership Summit. This two-day event was designed to highlight – for education leaders – the integral role BrainPOP can play in a 21st-century curriculum. Programming began with an inspiring keynote by Breakout EDU co-founder Adam Bellow, who spoke about cultural and educational trends that influence what teachers teach and what students learn. We then broke into a series of concurrent sessions that explored different education themes through the BrainPOP lens. Certified BrainPOP Educator Cathie Gillner led sessions on digital citizenship and literacy, introducing options for bringing the latter into each and every subject area via features like Newsela’s leveled articles and the SnapThought written reflection tool on select GameUp titles. She also talked about innovative uses for BrainPOP, such as concept mapping to enhance the “outer circle” experience for students in Socratic seminars. Mike Jones, also a Certified BrainPOP Educator, along with BrainPOP Lead Learner Robert Miller led sessions on STEM and formative assessment. 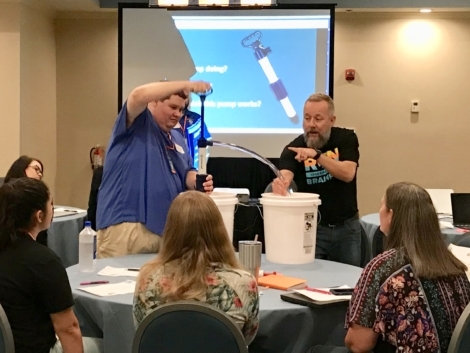 He engaged attendees with an exploration of pumps to illustrate how heart valves work, then had them apply their knowledge to game play and reflection in the BrainPOP-created title Guts and Bolts. In addition to leading a workshop on using BrainPOP resources to develop critical thinking skills, Dr. Kari Stubbs – our Vice President of Learning and Innovation – closed things out with a rich panel discussion. Mike and Cathie shared advice for implementing BrainPOP with fidelity to help all students engage and learn. Check out our pictures from the summit! Interested in reading more about the summit? follow #BrainPOPsummit or let us know if you’re interested in attending one in the future. We’re just getting started!